Two days’ worth of tomato bounty. There is usually at least one week in the tomato-growing season in which reticent plants, chock full of hard green fruit, will suddenly decide that they’ve dallied long enough. When that happens, you’re overwhelmed – nay, inundated – with ripe fruit, and you’d better decide what to do with it quick. What you see on the left is what happened when my nine tomato plants pulled this trick on me. I have four Roma plants and one each of Lemon Boy, Beefsteak, Brandywine, Old German and Sweet 100s Cherry. The cherry tomatoes aren’t represented in the photo, as I usually devour them as an amuse-bouche while I’m working in the garden. Now, I don’t like to refrigerate my tomatoes, and I didn’t have room in the chiller for all this bounty, anyway. So I decided to devote a Sunday afternoon and evening to converting the raw tomatoes into delicious home-grown, home-cooked comestibles. Batch #2 of sauce. Batch #1 was all Romas. I decided to start with tomato sauce. I make fresh tomato sauce a lot; there’s really nothing to it. You wash the tomatoes, pick off any visible stems, throw them in a big stockpot with some peeled garlic cloves, fresh herbs (I grow my own basil, oregano and parsley) and some olive oil, cover the pot and let them stew down. Give them the occasional stir and poke, to break up any stubborn fruit. Nope, I don’t seed or core them; the next step takes care of that. And no, I don’t add peppers or onions or any of that. I wait to salt until I’ve reduced the sauce – the last step in the cooking process. While the sauce tomatoes were stewing down, I got out my food mill. It is, shall we say, primitive, but it does the job and it has no moving parts to break. 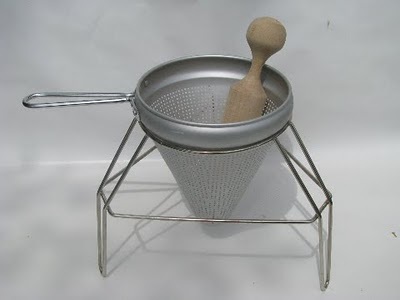 Its legs straddle my big high-sided mixing bowl nicely, and there’s something contemplative about rolling the wooden pestle around the strainer, sieving the hot cooked tomato mix into the bowl. It doesn’t take any great strength or agility to use – you just roll the pestle around and around. The tough tomato skins, leafy greens and all but the tiniest seeds are trapped in the mill, while all the flavored tomato juices and pulpy goodness go into your bowl. And cleaning everything is a snap – nothing to disassemble, no tricky areas to wash. I oil the pestle once in a while, but that’s about as complex as it gets. I let the tomato mix bubble away, occasionally fishing out a piece of garlic to press against the pot side with the back of a spoon. (I don’t mill the mix until the garlic has gone mushy.) Meanwhile, I contemplated the Lemon Boy tomatoes. For a single plant, the Lemon Boy has been extraordinarily productive, but I didn’t really want to its yellow fruit into my tomato sauce – I figured they’d make the sauce lighter in color than I like. Instead, I decided to use it in two new recipes: tomato chutney and tomato jam. Tip all ingredients into a large heavy-based pan and bring to a gentle simmer, stirring frequently. Simmer for one hour, then bring to a gentle boil so that the mixture turns dark, jammy and shiny. Place into sterilized jars and allow to cool before covering. Will keep for six weeks. Tomato Chutney – a work in progress. The chutney had a strong vinegar smell as it cooked down, but eventually that backed off and it mostly smelled like onions cooking – not unpleasant at all. While it cooked, I milled my first batch of tomato sauce and set it aside to cool for a bit, then got ready for the second batch of sauce. I washed the mill, the stockpot, my big chef’s knife and my cutting board, ran out into a light rain to pick my fresh herbs (which made me feel like a romance heroine, for some reason), peeled another round of garlic and got the big stockpot going again. Then I eyeballed my recipe for tomato jam, which came from noshmyway.com. Since the tomatoes had to be peeled, I got out my second-biggest stockpot, filled it halfway with water and while that came to a boil, I cut a shallow X into the stem-end of each tomato. A 30-second plunge in the boiling water made the skins come away nice and easy. Combine all ingredients in a heavy medium saucepan. Bring to a boil over medium heat, stirring often. 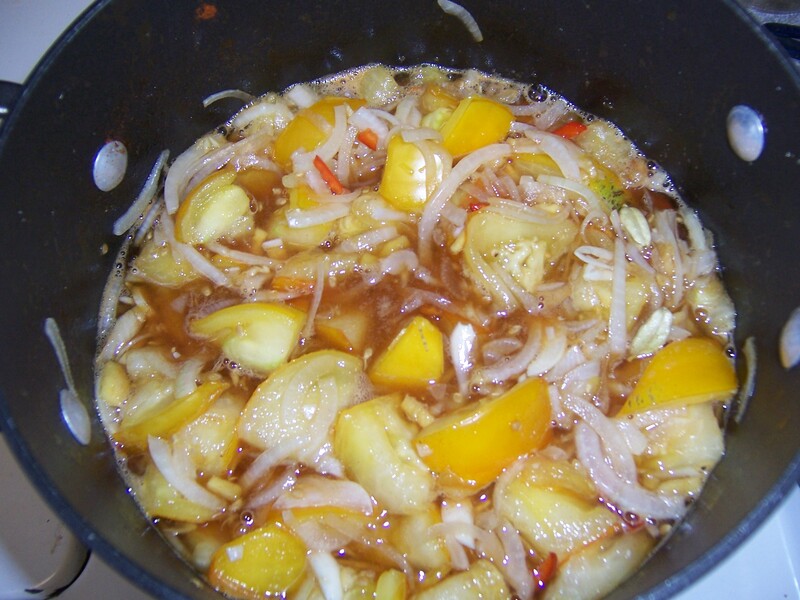 Reduce heat and simmer, stirring occasionally, until mixture has consistency of thick jam, about 1 to 1 1/2 hours. Watch carefully so the jam doesn’t burn. Remove from heat, cool and refrigerate. Will keep for two weeks. Makes approximately one cup of jam. 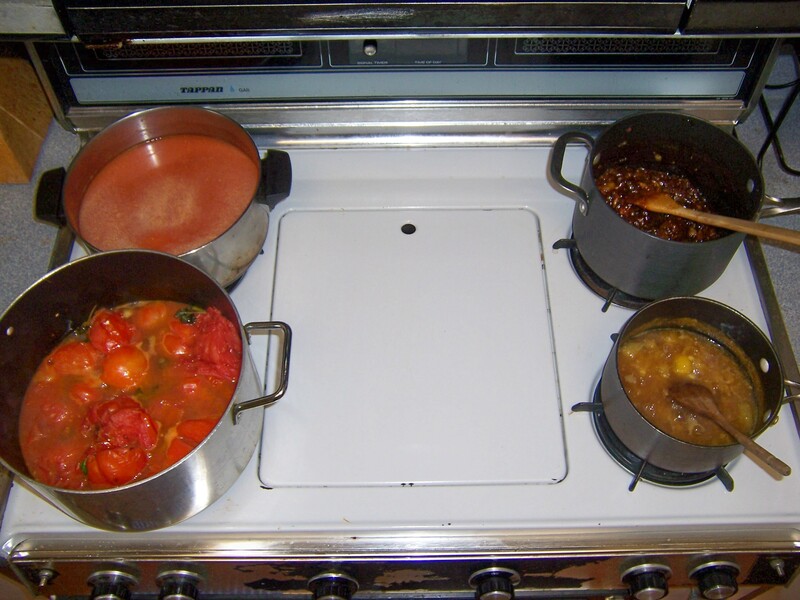 Clockwise, from top left: tomato sauce reducing, chutney cooling, jam simmering, second batch of sauce stewing. 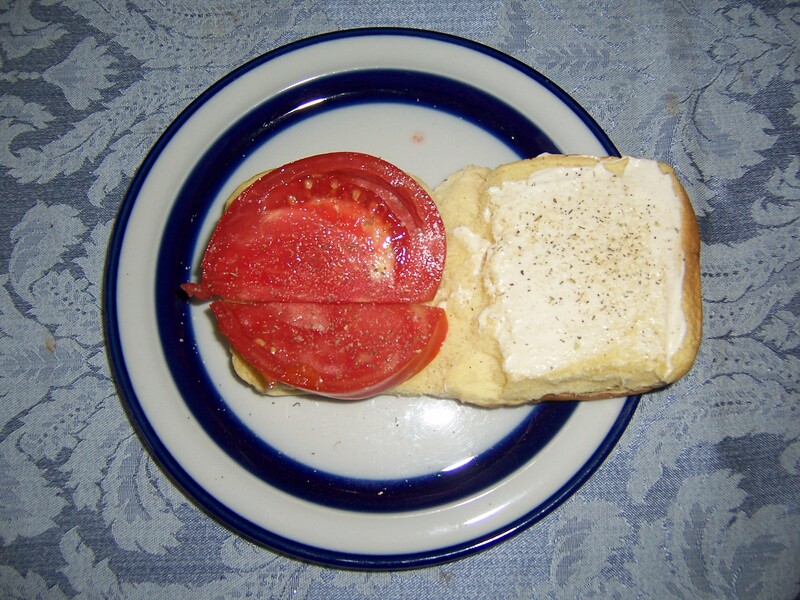 Everything smelled yummy and I realized that I had worked through the dinner hour, so I made myself a snack with a little reserved Beefsteak tomato. Martin’s potato roll, a slather of low-fat mayo, a little Penzey’s sandwich sprinkle, and I was good to go. The chutney was just about finished so I had a little taste of it. It was flavorful, but a little lacking in punch, so I added a pinch of red pepper flakes during the final reducing boil. I let it cool a bit, tasted again and added a touch more red pepper. It’s pretty good; next time I would definitely increase the raw pepper and maybe include some of the seeds, and I might also add some golden raisins, just for the look of it and some additional depth of flavor. The recipe says nothing about fishing the cardamom pods out when the cooking is done, but I did. I got about a cup and a half of chutney out of the recipe. I milled the second batch of tomato sauce, combined it with the first batch in the big stockpot to continue the reducing process and started to clean up the kitchen. By the time I was finished, the jam was just about done. I gave it a taste and danced around the kitchen making yummy sounds – it was that good. I had enough Lemon Boys left to make a second batch, so I got that going and then hovered over the sauce as it reduced. I tasted and tested, gradually adding salt. When it was flavored and thick enough for my liking, I pronounced it done and put it aside to cool. The finished chutney went into the refrigerator in a chubby mason jar. I got about a gallon of tomato sauce from my efforts, and that was decanted into three different containers and went into the freezer. The jam was separated into two containers: one for the freezer, one for the refrigerator. I bet that jam will be nice with Brie, or maybe cream cheese and crackers. So that was my big tomato day. I don’t know if that’s going to be the Big Harvest for the season; it’s early yet, and lord knows what the late summer will bring. But it felt good to get so much cooked and stowed away for later eating. And then you put some tomatoes out for the squirrels. You did, right? Right??????!!! FABULOUS! Thanks for sharing these pictures, recipes, and your delicious prose. Sally Martin introduced me to the idea of marinating goat’s milk feta cheese in olive oil with lemon zest and rosemary (or your favorite herb seasoning) then baking at 350 for 20 to 30 minutes. Spead a bit of that on french bread or and top with fresh tomato direct from the garden – Heaven! Joan, the squirrels have been helping themselves to the tomatoes, though they’ve been polite about it – only one or two a day. James, that sounds absolutely delicious. I have plenty of rosemary in my garden and am always looking for a new way to use it! Thanks for the recipe! Look at you all blogging and stuff. Too many tomatoes?! Ah, don’t gloat, it ain’t attractive.:). They look beautiful and the recipes sound delish! At least you have ripe tomatoes, mine are still half dollar size and green. Heavy rains and lack of sun up north did not help the plants much. Many where washed away when the back yard flooded. Your sauce looks good, mail up a jar or two. Still have a few weeks keft of summer, hope you and John are enjoying it. Paul Mig. Update on the chutney: after several weeks in the refrigerator, the flavors of the chutney have blossomed and it’s become my go-to condiment. It was heaven on a sandwich made of leftover roast pork loin!